Use the Maryland Free Legal Answers website to provide brief advice to low-income Marylanders. An attorney advice-a-thon with food and cheer! What is the Maryland Free Legal Answers website? Maryland Free Legal Answers is a virtual legal clinic where eligible clients request brief and limited advice and counsel about a specific civil legal issue from a volunteer attorney. Attorneys provide information and basic legal advice without any expectation of long-term representation. The website is operated by the Pro Bono Resource Center of Maryland. All attorneys are welcome to volunteer! While there are certain types of legal questions that regularly come up at legal clinics, we need attorneys with different areas of expertise and practice to volunteer for this online service. We hope the website will appeal to attorneys who want to give back but have been unable to participate in traditional pro bono work due to family obligations, schedule, or geographic location. We also hope to engage attorneys who already provide pro bono legal services and are willing to give more of their time to those who need it. 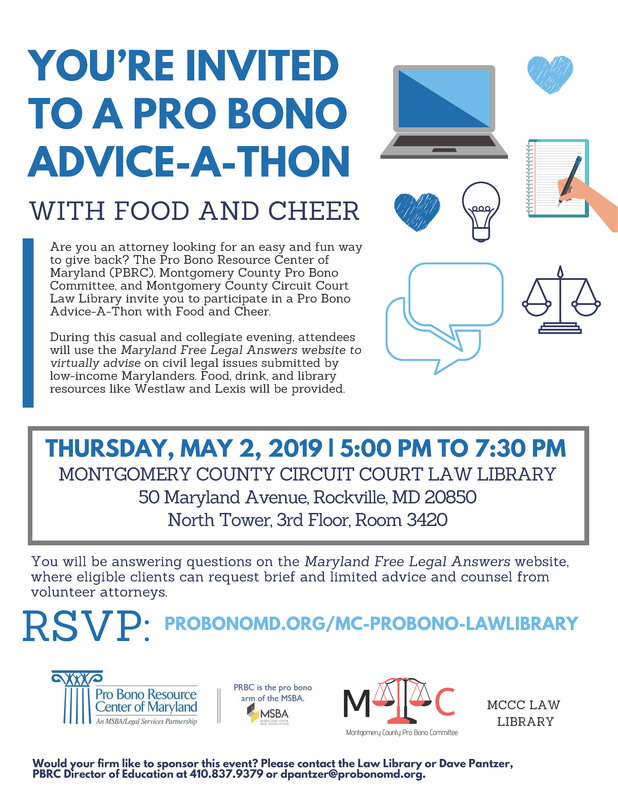 What is the Pro Bono Resource Center of Maryland (PBRC)? PBRC is the pro bono arm of the Maryland State Bar Association. PBRC trains, supports, and matches volunteers with every pro bono program in the state, connecting attorneys with meaningful opportunities in their own communities. PBRC also trains and mentors attorneys in service-learning projects involving court litigation; brief advice; and transactional practice to benefit low-income Marylanders. For more information about PBRC’s training, visit www.probonomd.org/training. Questions? Contact Dave Pantzer at dpantzer@probonomd.org or 443-977-6721.